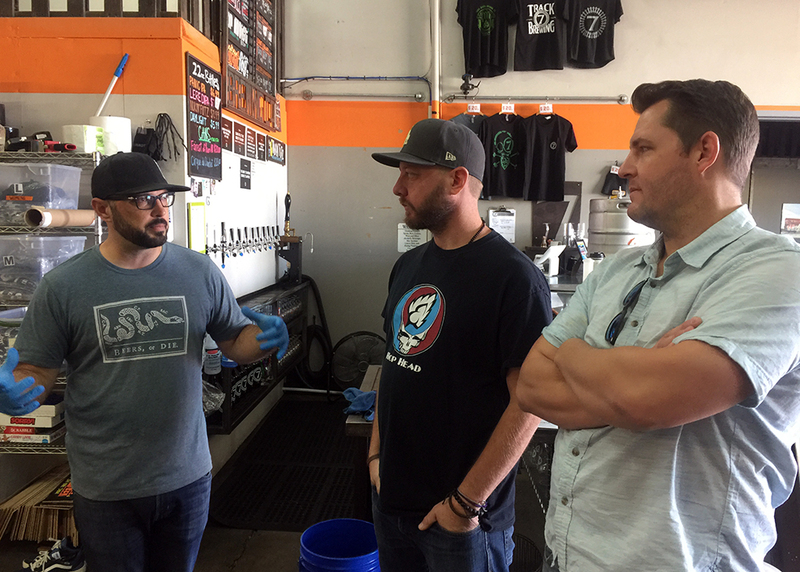 WW beer specialists Cameron Brown, Matt Ewing and Eli Lambdin took a trip to Track 7 Brewery in Sacramento, California. Track 7’s original location is in a rougher part of town, next to the train tracks. They’ve completely embraced this small beginning. When they started there were just a handful of breweries in their market. 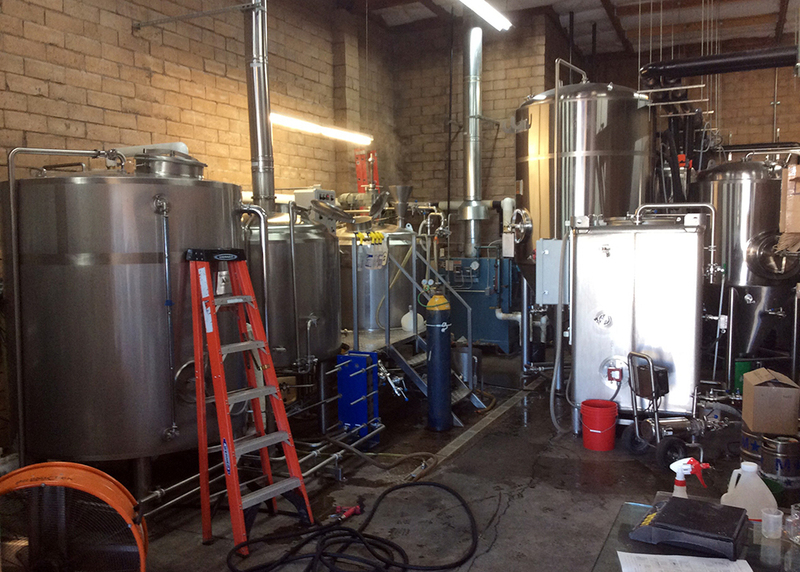 A year after opening, they expanded their tiny brewhouse, buying out the unit next door. Three years after that, they opened up their enormous main brewing facility in Matomas. They are now the largest brewery in the area, brewing more than 30,000 barrels a year. It’s no shocker either, in order for a brewery to thrive their core beers have to be perfect, and their one-offs need to be fun, exciting, and well executed. Things that Track 7 has down pat. The original location is mostly used to brew Track 7’s fun one-offs; crazy milkshake IPAs with fresh honey, pastry stouts, high ABV fruited kettle sours (with or without lactose), cryo IPAs, you name it. 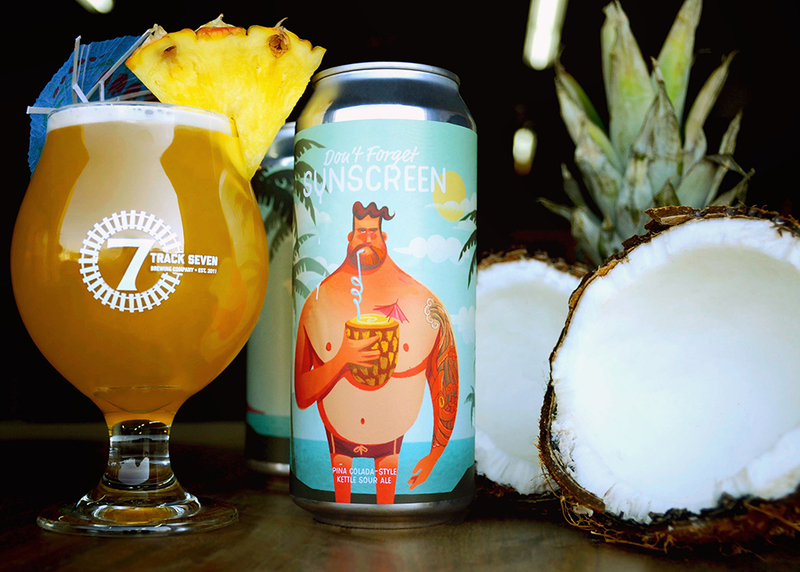 It’s here that we helped brew Don’t Forget Sunscreen, a kettle sour based on a Pina Colada, with plenty of pineapple and coconut. 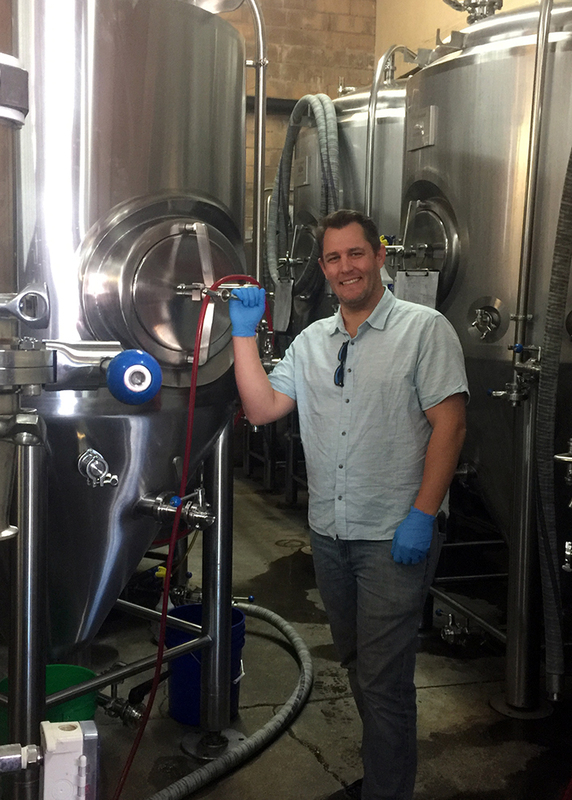 Ryan the brewer/owner, not only has a mind for the whole operation, he’s the driving force behind every detail of the brewing process. He patiently answered all of our questions. 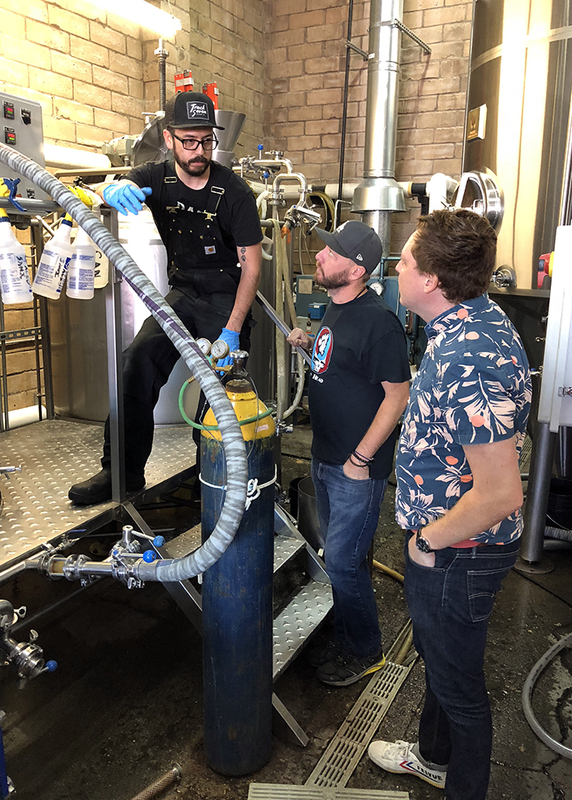 They use a yogurt culture to start their lactic fermentations, yogurt has multiple strains of lactobacillus, and Ryan feels this brings a bit more complexity to the table. A single completely pure strain can end up a bit one dimensional. He also taught us about the difference between pH and perceived sourness. Turns out you can have something with a high pH (less acidic) taste more sour than something with a low ph. In the context of beer tasting pH isn’t the best guide, titratable acidity is the preferred number as it gives a decent approximation of total acidity. 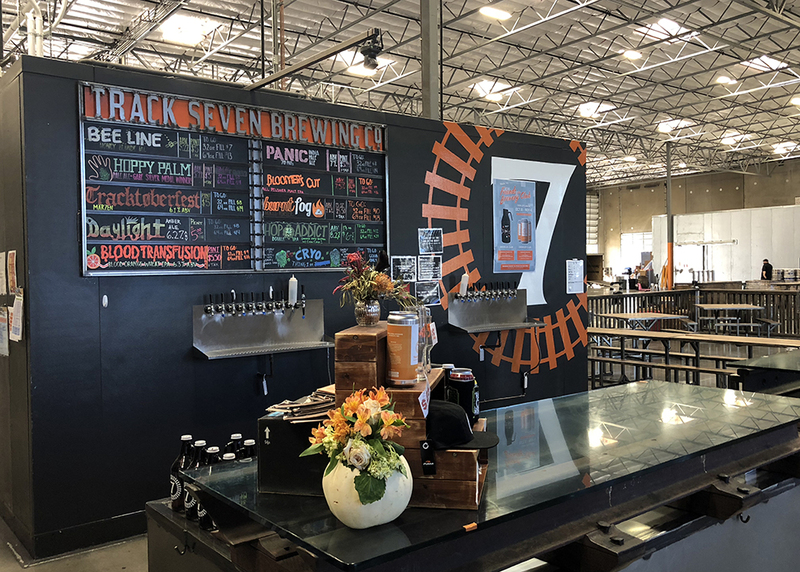 Track 7’s new restaurant and tap room couldn’t be further from their original location. Named “The Other Side by Track 7” and smack dab in the middle of the “40’s,” Sacramento’s old school swanky neighborhood (it’s the one that Ladybird always wants to live in). Here they’re doing awesome dishes centered on rotisserie chicken. Well done creative faire like pork shoulder, jalapeño slaw, chimichurri fries, and award winning mac ‘n’ cheese. They’re getting really creative in the back of house, placing rotisserie chicken skin in ovens and roasting it low and slow until it’s bacon-level-crispy. The chef takes these skins and piles on a deconstructed Caesar salad; we paired it with a Panic IPA. For dessert is a chocolate cake infused with Nukin’ Futz, with a thin layer of butterscotch peanut brittle cream in the middle. Perfection. It’s awesome to see what one very driven and talented home brewer has built in a short amount of time. Cannot wait to see what comes next. The main notion that I have always imparted to accounts regarding Track 7 is that they stand out in the craft beer scene. This is due, in part, to their beers being so approachable and affordable, whilst their brewers propagate and maintain a highly innovative mindset. The adherence to unyielding creativity and dedication to “the craft” is seen at every level. Upon first arriving at California’s state capitol, we were greeted warmly by the sales manager, Amanda. She promptly whisked us to the Natomas brewery where my fellow cohorts and I were treated to an intimate tour of the brew facility. We were met by the sweet smell of cereal malts, indicating that multiple brewing sessions were, indeed, in process. Our excitement mounted, as we passed by the soon to be clanging and clamoring bottling line, the then dormant mobile canning unit, through the stacks of majestic malt, and onto cold storage. Once rolled open, the doors revealed a bevy of beer, readied for impending consumption by ardent Track 7 fans. It was in there that our eyes feasted on cases of coveted hop varietals (Citra and Mosaic), which were to actualize their destinies as key components of delicious libations. We rolled up to a rather unassuming retail complex on Folsom Blvd, not knowing what delights our taste buds would encounter. After taking in the scene, a humble taproom and eatery rooted by intentions of family-style rotisserie dishes and community togetherness, we seated ourselves and made ready our gullets. After the sun settled and rose once more, we were ready to brew our Pina Colada Kettle Sour. 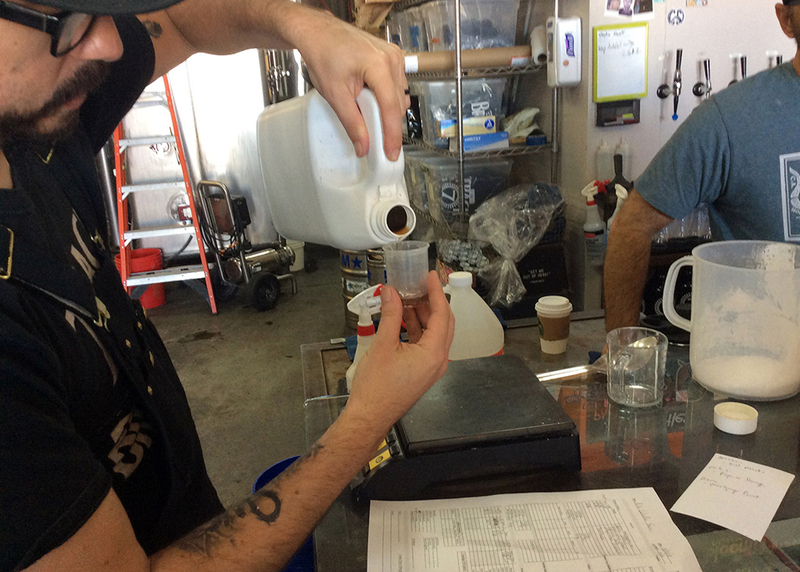 If one knows anything about homebrewing, they know that cleaning and sanitization is integral. When producing a batch on a more grand scale, especially for distribution, it’s even more of a concern. I learned that brewing on this level necessitates a keen eye turned towards timelines, intentional ingredients, and tirelessly, dedicated brewers. I must remark that this brewery is truly composed of a dedicated troop of individuals, led by owner/brewer, Ryan Graham, who embodies the tenacious, unyielding nature of those devoted to their craft. We helped brew a Pina Colada Sour built of freeze dried pineapple powder and toasted coconut. This was the first time that I was involved in brewing a sour ale so naturally I learned quite a bit. Two main things: lactobacillus (which helps sour the beer) works much better without Co2 and sour beers are measured by titratable acids as opposed to pH acidity to determine how “sour” the beer will taste. 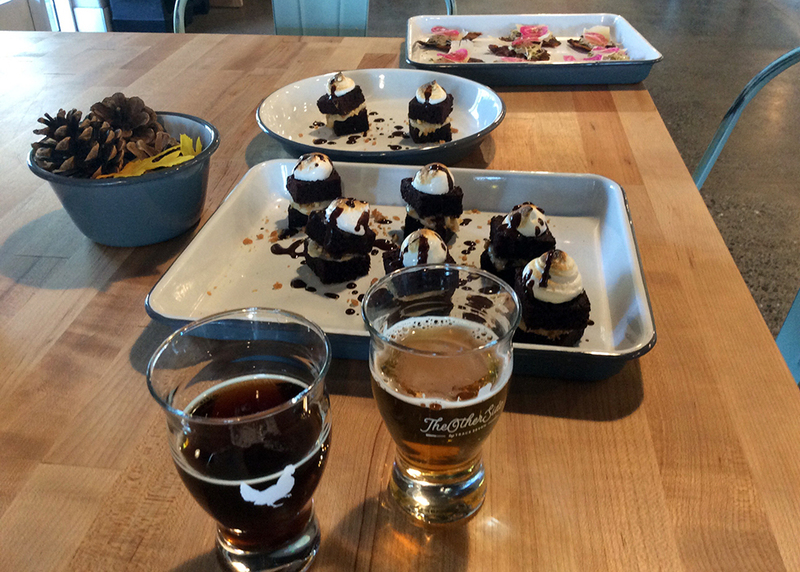 The stand out beer/food pairings was a chocolate cake sandwich with Nukin’ Futz baked in the cake, candied peanuts and topped with sweet cream and drizzled with caramel and chocolate paired with Nukin’ Futz chocolate peanut porter. The knowledgeable Track 7 staff creates a fun and informative experience between their two breweries with taprooms and the top notch restaurant, not to mention the great brews. If these were in my neighborhood I would have a hard time leaving. If you are in the Sacramento area I highly recommend visiting one of their locations, and if not in the area pick up their beers in your local bottle shop! 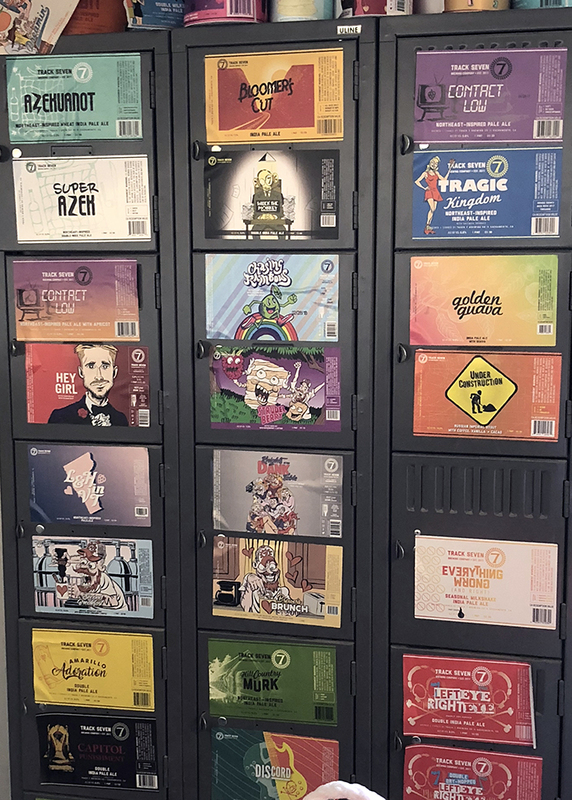 Track 7 as a whole makes awarding winning core/year round beers they also make amazing specialty, seasonal, sour and barrel aged beers with kooky fun packaging.